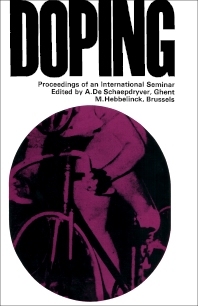 Doping brings together the proceedings of an International Seminar on Doping organized by the Research Committee of UNESCO's International Council of Sport and Physical Education and held in Belgium in May 1964. The papers explore the doping problem in sports and physical education using a multidisciplinary approach, with emphasis on the pharmacological, biochemical, psychological, ethical, social, and juridical aspects of doping. This volume is comprised of 13 chapters and begins with an overview of the general and pharmacological aspects of doping, along with the essential points in the objections against doping. The following chapters deal with the epidemiology of doping and antidoping strategies; the problem of doping in horse racing; methods for qualitative detection and quantitative estimation of dosage of doping agents; and psychological aspects of doping. The results of a comparative study of some doping agents are also presented. Subsequent chapters consider research findings on different doping substances used by sportsmen; the effects of drugs on muscular performance and athletic performance; and the use of doping substances in the preparation of athletes. The final chapters look at the ethical and juridical aspects of doping. This book will be a useful resource for pharmacologists as well as athletes and sports officials.